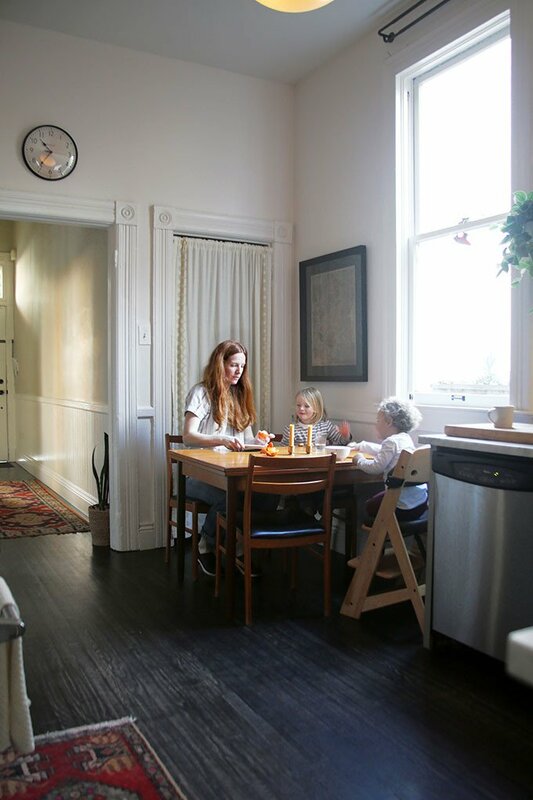 On embracing a shared space: Our home is pretty small, around 750 square feet. When we had one child, and then another, friends would ask if we were planning to move, but it’s in a central location, and we love it here. 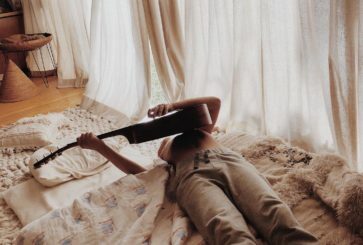 My entire life, I’ve never had a room of my own. I had roommates in college, and then Sarah and I moved in together right after that, so I’m used to sharing space. Mother and child print: Tali Yalonetzki. Throw blanket: Cushendale Woollen Mills. Pendant lamp: Noguchi. Rug: Overstock. Sofa: DWR. Coffee table: vintage. Upholstered chairs: vintage. Patterned pillow: eBay. The stained glass window is original to the house, which was built around 1900. 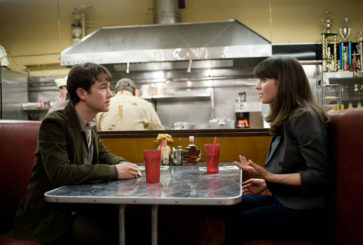 On paring down: We try not to hang onto many things, because we just don’t have the space. My brother will joke, “Do your kids even have toys?” At his house, they have a playroom filled with things, but in our home it’s like, if you haven’t played with it in a week, it goes! That being said, there are still some things, like the number of cookbooks I have, that I’m sure Sarah would love if I could pare down. On working from home: Since I work from home, usually at our kitchen table, the space has to be a lot of different things. In my fantasy world, it would be nice to have an office. The day ebbs and flows — when I’m here by myself it feels quiet and spacious, then from 4:30 to 7:30 it’s kind of crazy. When I invite people to dinner I always joke that they’re coming to the least relaxing restaurant in the city. On cooking with kids: I try to involve the boys in cooking but it’s kind of a pain! They make a mess, and they’ll burn themselves on the waffle iron after I’m like, “Don’t touch it, don’t touch it, don’t touch it.” So I’ll set them up with a job like dumping an ingredient into a bowl and then they’ll go play. On writing cookbooks: Sarah was pregnant with Ellis when I was working on Charles Phan’s book, Vietnamese Home Cooking. She was nauseous the whole first trimester, while I was testing the recipes at home, and so many of those recipes contained fish sauce. She was dying from the smell, poor thing. Now I’m coming out with my own cookbook next year. It’s called Repertoire. This will be my collection of slam-dunk recipes you can cook over and over again. On using the good stuff: We keep our nice ceramics out and use them all the time. I’ve gotten beautiful cazuelas and bean pots from Bram, up in Sonoma. Our dinner plates and larger mugs are from Canvas, and I have some platters that I adore from Miranda Thomas Pottery, which is made near my Vermont hometown. On open shelving: You know when you think something’s not going to be a big deal and then it ends up being the biggest deal? That’s what happened with the wood shelving. Sarah found this guy online who had reclaimed barn wood. He sent us the shelves, and they were all wrong. The wrong thickness, the wrong stain. We felt bad, but we returned it to him and he re-did it. He sent it back a second time and it was still wrong. So we brought it to a wood shop here to get them planed and re-stained. It ended up being a money pit nightmare, but I do love them! Countertops: Statuario marble. Cabinets: IKEA with new hardwood cabinet fronts, painted with Sherwin Williams Unusual Gray. On family meals: We’re fortunate that our kids aren’t picky eaters, but they do have weird habits. I don’t like to make separate meals for the kids, but I want them to like what they’re eating, so I’ll make modified versions. I’ll make vermicelli rice noodles with little meatballs and mushrooms and shallots, and then Sarah and I will eat the same thing, but with pickled carrots and spicy chili sauce on top. We’ll also rotate days where each person gets to choose their favorite meal. Table and chairs: vintage. High chair: Special Tomato. On nature vs. nurture: My wife gave birth to Ellis and I gave birth to Sidney, which I think it somewhat unusual. It’s been fun to see what plays out in terms of nature vs. nurture. Even though we try to parent them similarly, Sid is a really intense two-year-old; he’s not go-with-the-flow. He watches his big brother and he wants to do all of the stuff. Of course my mom likes to tell me that I was exactly like Sid. 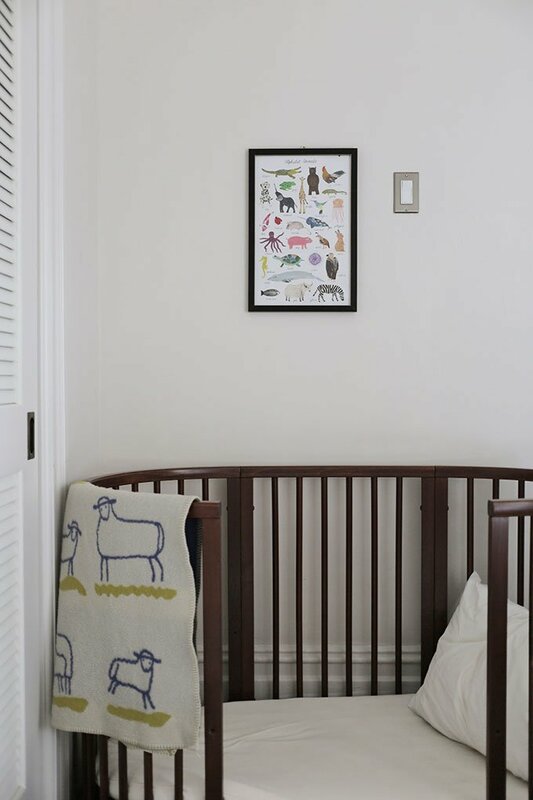 Animal print: Forage Paper Co.. Crib: Stokke. Sheep blanket: Pendleton. On co-conspirators: Ellis is almost five and Sidney is two. They’re crazy. The other day, I left the room for a minute and came into the kitchen to find that Sid had pushed a chair from the dining table and climbed onto the counter. He was reaching into the cabinet to get some Valentine’s Day candy. Meanwhile, Ellis was hiding in the bedroom with the door closed. I thought he was in there behaving himself, but he was in there eating candy! They had hatched this plan together. Bed: Jenny Lind style, via Craiglist. 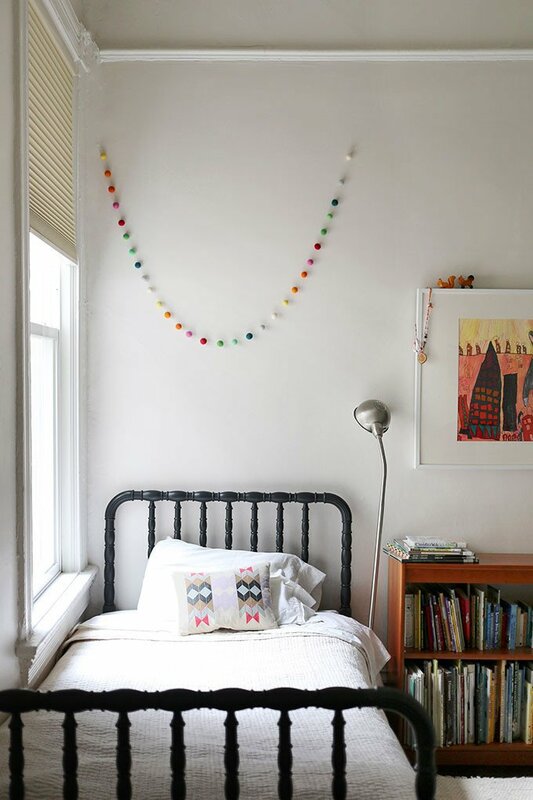 Pom-pom garland: Etsy. Framed artwork: Creativity Explored. On creating a relaxing space: My one pro parenting tip is to buy a king size bed the moment you have a child. We did that, and the bed no longer fit in our bedroom, so we put the boys in our room and moved into the other bedroom in the middle of the house. But it’s worth it. Our bed is our prized possession. We both like darkness when we sleep, so we bought blackout shades. People come to our house and are like, “What’s up?” because it’s dark and there are white noise machines playing, but that’s how we make it a little more serene. Cactus print: Etsy. Pendant lamp: Moooi, purchased at Propeller in Hayes Valley. Bed: West Elm. Bedding: Garnet Hill. Night table: vintage. Bedside lamp: vintage. On a lack of privacy: We have a split bathroom, which is something I never saw before I came to California — a sink and toilet in one room, a shower and sink in the other. When Ellis was younger he went through a period of locking himself into the bathroom as a funny joke, necessitating some lock picking, so after that we made a family rule: no locked doors in our house. Sarah and I have given up any hope for privacy. On getting married: We got married at Cambridge City Hall on May 17th, 2004, which was the first day you could get married anywhere. We were planning to get married anyway, but we went to City Hall to get our license and see the scene, and it felt like such an amazing day that we were like, why not now? So we called my brother and said, “We’re getting married, can we come pick you up?” He took the day off and we went to lunch together. We saw couples who had been together for 20, 30, 40 years finally getting married. It was an historic moment. Drawers: Storage bins from IKEA topped with a custom wooden shelf. Runner: Pottery Barn. On personal artwork: My cousin Kate True paints a portrait for every person in the family when they get married. 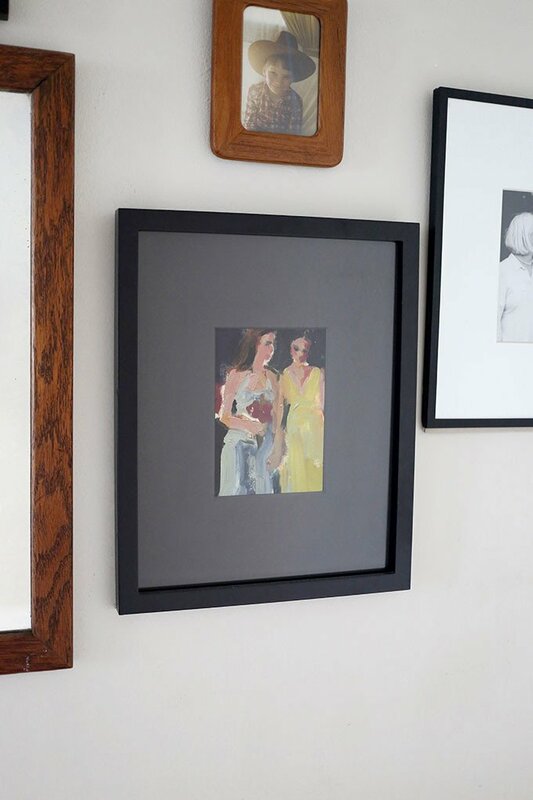 We have the final portrait in our living room, and this color study in our hallway. It’s such a sweet family tradition. Thank you so much, Jessica and Sarah! Your home is lovely. P.S. 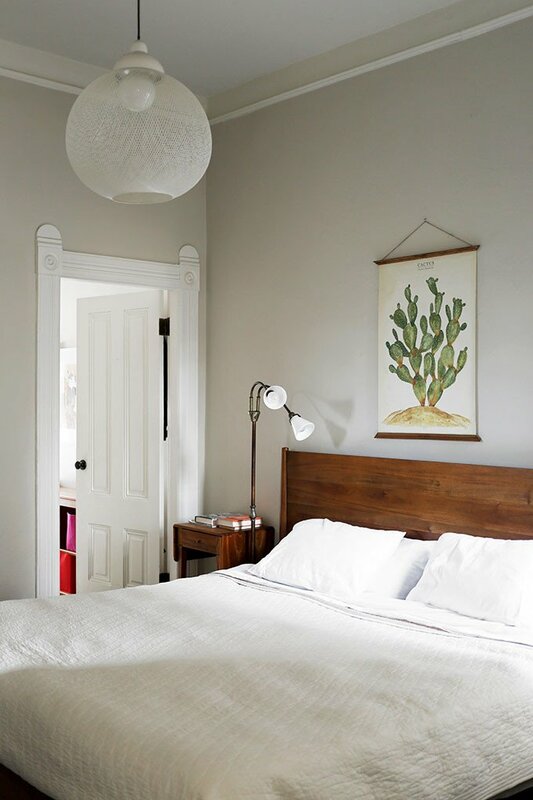 More house tours, including another San Francisco home and a beautiful Brooklyn brownstone. What a lovely home you have! I’m wondering if you remember the grout color used with your kitchen backsplash? It’s beautiful! Hi! May I ask where the brass kitchen faucet is from and the towel/toiletries rack in the bathroom are from?? I know this is a past post but have been coming back to this one, their home is so inspiring! Purchasing a satin gold faucet – wondering where yours in from. I have been looking at watermark but it is very expensive. Yours looks great could you tell me the brand please. Thank you. Everything looks soooo fabulous, and glad to see you finished the kitchen, great job!! Love seeing the custom cabinets we built for your living room library :). can you tell me where you got your kitchen cabinet handles from? They are really lovely and special. Thanks! I would also love to know where the kitchen faucet came from as well as the knobs. Beautiful, beautiful home! What color are your bedroom walls? Love the neutral, subtle tone of the color. Lovely home! 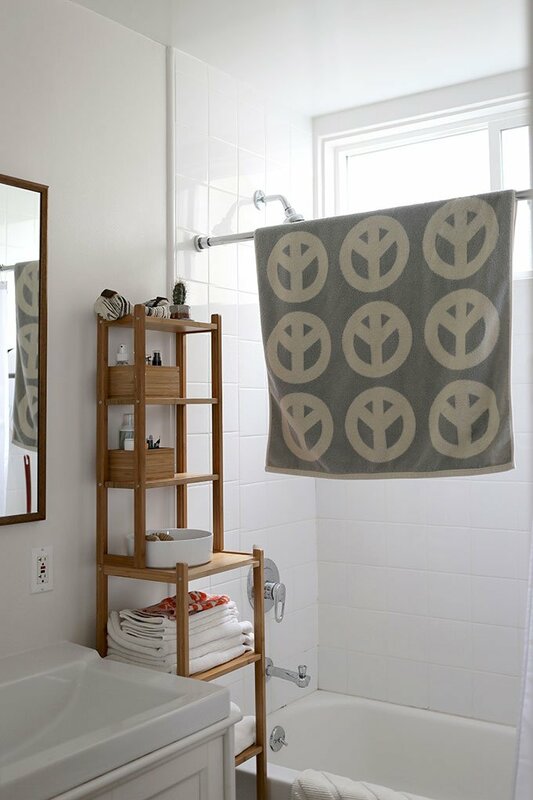 Where is the brown shelf/cabinet (where the towels are sitting) from? This house is so pretty! What a great place! If the owners are still responding to comments, I’d love to know where they got that amazing bathroom storage piece. I have never seen one that narrow and nice looking — and I’ve looked everywhere! Please share if you can. Hi Bianca! Sid is definitely gaining on Ellis. Come visit! What a beautiful home! Being from Vermont, also not far from Miranda Thomas Pottery, I have to second the shout out! For our wedding my parents gave us an absolutely beautiful wedding bowl by her, just like the one they have, and it’s such a special keepsake for us. Gorgeous! I was in your same year at MHC, Sarah–So nice to see you again, and you have such a happy-looking family! Would love to know what kind of mattress you chose for yoir king bed. Go Yoke! I was in the class below. The mattress is from European Sleepworks in Berkeley. It was expensive but the only mattress we could find that was made with natural materials and not treated with toxic flame retardants. It is so comfortable! I love this home. 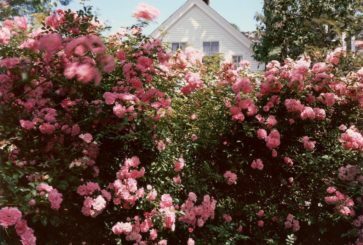 It feels calm, beautiful, and lived in. Their family is lovely and inspiring to manage with one bathroom and 4 people! Can’t wait to read the new cook book. I don’t understand the fancy fronts to the ikea cabinets. I love this idea, but how does it work? 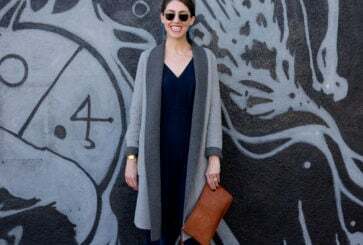 Super simple: there are many spots online that just sell the fronts–you can choose a style you like and send measurements for each front you want to replace (the company we used provided good info on how to measure). They come unfinished so you can paint or stain however you’d like. And so much less expensive than new cabinets! Awwwwww, our most wonderful (former) neighbors – best couple ever! Love and miss them!! Gorgeous house and heart warming to see such a lovely couple. Makes me excited about owning a house with my fiancée! 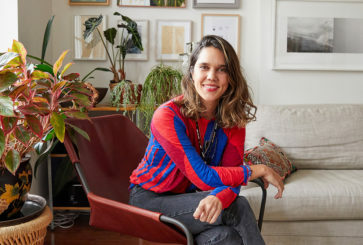 Sarah and Jessica are friends and it warms my heart to see them here and also so inspiring to see their restraint with placing just the most beautiful and useful items in their home. Hooray!!! Also, Jessica’s Repetoire cookbook is going to be a total gem – can’t wait !! WOW!! What a gorgeous space!! Wow – their home looks so peaceful and pretty! I would love more info on the cookbook she’s writing! I want to thank you for showing all kinds of families. I’ve been married to my wife for almost six years and I love seeing more families like us. It’s nice to see diversity! Plus the house is fantastic! Lesbians on Cup of Jo! I thought the day would never come. Such a lovely home, can’t wait for the “slam-dunk” cookbook. Everything looks so lovely, white and crisp! And all of the natural light is definitely a point of envy :) It really brightens up a smaller space; and the open shelves are excellent! 1. When I saw your first picture I thought the oldest looks like his Mom he’s sitting on the youngest looks like his other mom. 2. Nature v. nuture is sooooo interesting/fascinating to me. My son was a preemie and was turning purple in the nicu trying to get out of the swaddling – he still hates blankets and being constrained. His father has never been in his life but I can see characteristics of him and its just so.interesting! 3. yes! I hate cooking with my son! hate it! so many people talk it up as this great thing when it really stinks. luckily, he has as much patience as I do so if it doesn’t result in immediate gratification of a delicious item or spoon to lick, he’s not interested. and if it includes touching something disgusting feeling, he won’t even come in the kitchen. 4. I love that tradition of your neice—that painted picture is lovely! 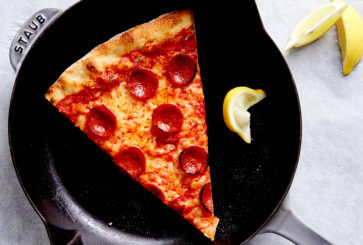 I would love to see a feature of that cookbook when it comes out! Maybe test out a couple of the “slam-dunk recipes,” I need more of those! I desperately wish we had gotten a king size bed this past spring. We didn’t because we want to enforce a “no kids in the bed rule,” but I’m pregnant with our second and my husband has apparently forgotten the pregnant lady pillow situation. Even just for pregnancy the king size would be so worth it. Such a beautiful house – I love the curtain rails in the living room. I am a little obsessed with curtains, no place I’ve ever lived in, and there have been a lot, has had the room for good curtain rails. Are they double ones? Where are they from? Hi- yes, they’re double rails. They were installed by the previous owners, but I’m pretty sure they came from Restoration Hardware. 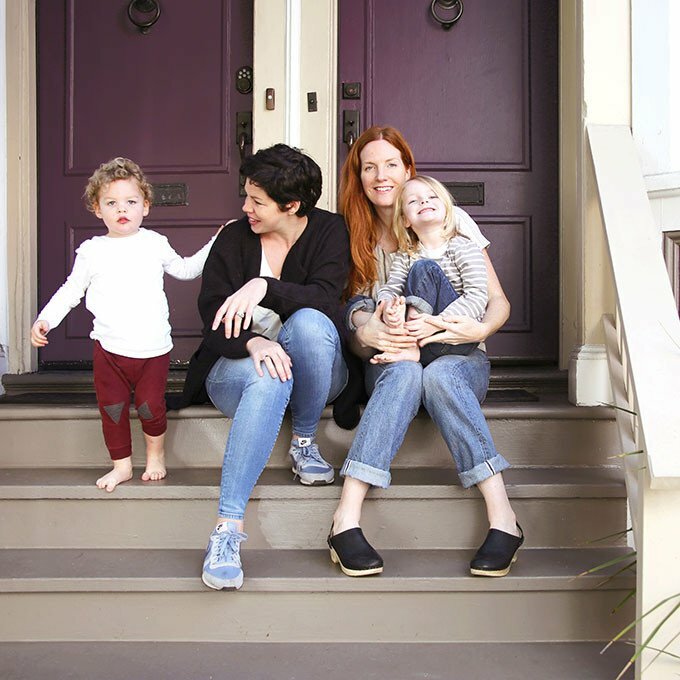 What a lovely family in beautiful home that balances esthetics, coziness and practicality! I totally had aspirations to live in Duboce Triangle before moving to the East Bay. We are renovating our kitchen and I would love to know more about kitchen sourcing — cabinet doors, pulls, faucet. Thank you! Thanks! I ordered the cabinet doors from cabinetdoorsdepot.com. Their site isn’t super-slick, but the customer service and the doors themselves were great and I definitely recommend them. The faucet is Delta Trinsic, and the drawer pulls are vintage, found on eBay. I love how the home tours on Cup of Jo always include info about the families—their lives, tips about things other than home stuff, etc. I think it’s unique and makes me enjoy the tours even more! What a cozy home!! Love it! Such a lovely home! I would like to know where the shelves in the bathroom is from, such a nice clean design! You have such a beautiful family and home, thank you for the design inspiration! 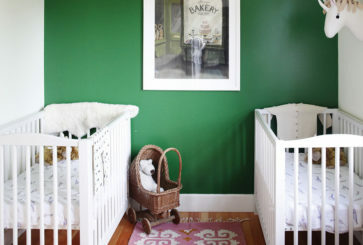 I would love to know what paint brand/color you used on the walls in each room if possible, I’m on the hunt for the perfect neutral palette and the colors you used are exactly what I’m looking for! Thank you, Juliana! The slightly off-white paint in the bathroom, kitchen, and the boys’ room is all the same Origami White from Sherwin Williams. Sorry, I don’t have names of the colors in the other rooms. What a lovely space. I love their aesthetic. And I LONG for a King bed! What a beautiful home! My family lives in a small apartment that we love except it lacks any yard and our toddler loves being outside. How do you do it? Lots of trips to the park? Yeah, we are regulars on the park circuit and grateful we live in a mild climate. I wish we had a yard! 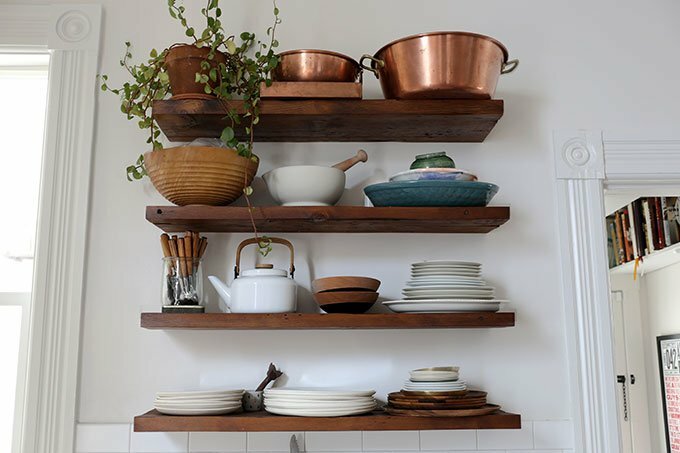 I love open shelves in the kitchen as much as the next person, but it’s really a terrible idea in San Francisco (or LA, for that matter). Any earthquake (even minor to moderate) will wipe out that whole beautiful ceramics collection. Here’s another Bay Area resident whose first thought upon seeing the open shelving was earthquakes! What a beautiful home tour and family! My wife and I live a few blocks away from the Duboce Triangle neighborhood, and we get a little jealous every time we wander through all those free standing homes. As a married lesbian couple about to have our first child, I can’t tell you how refreshing it is to see a two Mom family featured on here. I’ve been reading CoJ for years, and I think I smiled the hardest reading this post. Congratulations on your baby-to-be! Say hi if you see us in the ‘hood. What a sweet family! I’m swooning over the copper bowls, the rugs and that coffee table. Thanks for sharing! Sorry to pick, but isn’t the paint Sherwin Williams, rather than Sherman Williams? Ha! Great eye, Trish. Just updated. Thanks so much. This tour is wonderful! I also live in Duboce Triangle in a Victorian flat with my two small children (and one split bath). I wonder if we’ve ever played with these cuties in the sand box at Duboce Park. For the comments worried about open shelves in earthquake country, we have open shelves similar to those featured here, and my husband is from the Bay Area to boot. I think an earthquake of the magnitude people are worrying about would send plates flying out of most cabinet doors. I love our open shelves! In the small spaces we treasure in San Francisco, they look so much lighter than heavy cabinetry. Thank you so much Sarah- and Nicole for asking!- I totally followed this link last week and have been geeking out considering buying it, and just did!! I’m super excited. 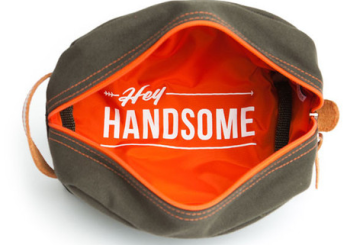 I was encouraged by the fact that you have it in a home with two young kiddos…. any stain prevention/removal tips for it? Such a lovely home and family! This is a beautiful, beautiful home. I am thinking about a kitchen renovation and may use your look. I am in love with it. I am glad you found it inspiring, Trish! The open shelving is beautiful but not ideal for SF. What about earthquakes? The wedding portrait is incredible and beautiful. And, I’m so inspired to get a king bed. 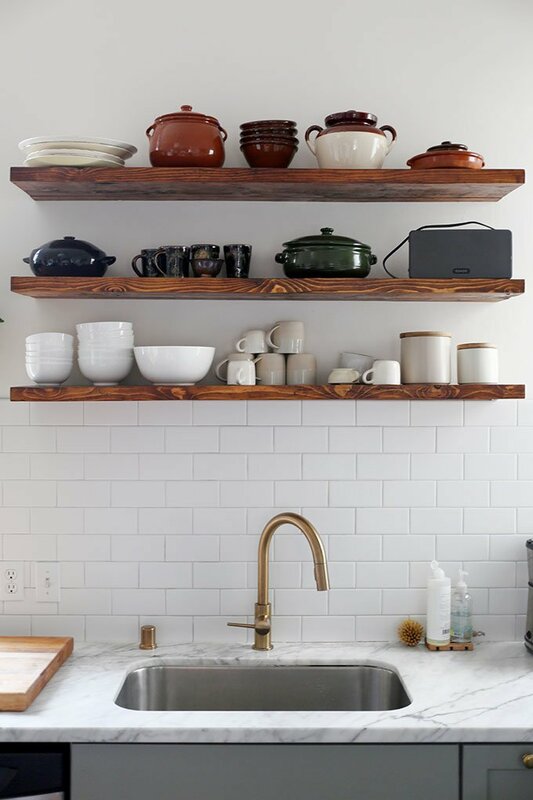 I love the open shelving in their kitchen so much! 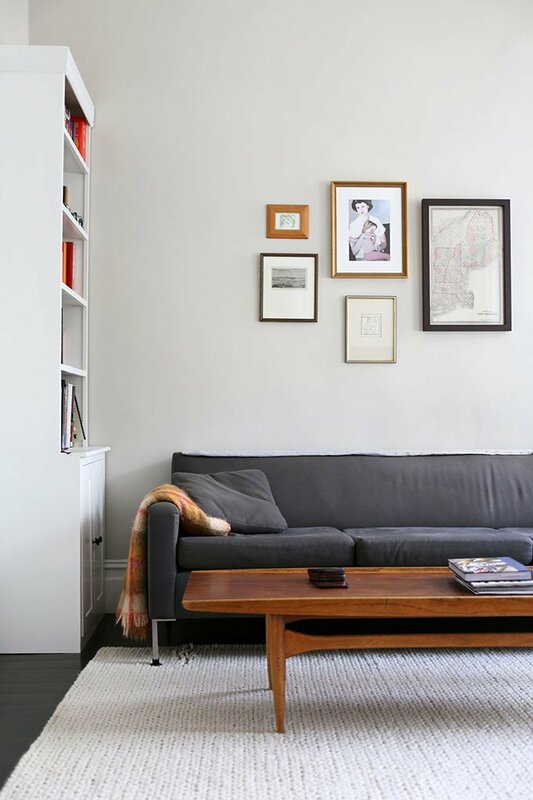 Every time I see a home like this (so pared down and minimalist) I am so enticed by the idea of smaller spaces and less ‘things’. Our home is wonderful but bigger than we need, I would love to pare down so much once we move in a couple years! Especially the stuff about kids toys!! I laughed when I read this. My fiance grew up in San Diego and when we moved in together in NYC he said, “You can’t hang a picture above the bed!” And I asked why not and he couldn’t even tell me. It took him a minute before he realized this was a California thing because of the earthquakes. It’s funny, the knowledge you take for granted. I have open shelving in CA. You can either live in fear or live beautifully the way you want. If the dishes break… C’est la vie! Love the simple clean looks. Joanna! It would be awesome to see some ideas for prom for the younger readers and also for some of us with high school daughters. Prom dresses are so blah. Maybe you could share some ideas? awww I love the kitchen and the window in the living room. I want a cozy kitchen like that! Beautiful home! Btw, would love to learn the paint colors on any future tours if possible. Please tell us when it comes out. Beautiful home and beautiful family! My husband and I are moving from NYC to San Francisco this fall, and I cannot wait to explore this enchanting city. I love this tour! I’m obsessed with the wedding portraits. Such a sweet tradition! The candy story made me laugh out loud…my kids are almost 4 and 2 and they hatch plans together now. I can’t even be mad because I love that they see themselves as a team, but it does make you wonder how you can be so easily outsmarted by small children! Lovely home! And I completely agree with your small space sentiments. Love your neighborhood, love your space and let “things” go. Thanks for sharing! 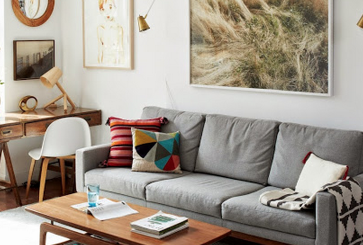 This home is so nice and dreamy – cozy and also super stylish. Love it! I also love and appreciate when you feature families that don’t fit into the standard white/skinny/hetero-normative formula of most style/fashion/family/lifestyle blogs. Thank you! Everything is really pared down! Good for them. Amazing tour. I want to know about those floors! Gosh, they are gorgeous. What a beautiful and peaceful home. I love these tours. And Jessica’s new cookbook sounds like something I need in my life! Gorgeous house. I second the king sized bed purchase- as soon as you have a child. It is so nice to see a two mom family featured! I love this house! I would live here in a heartbeat. Also, I grew up near the same town in VT. I adore Miranda’s pottery. 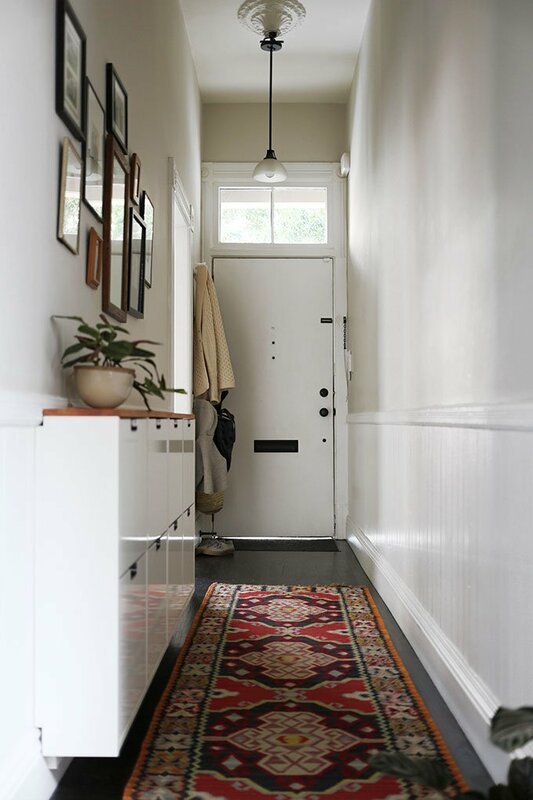 I am in love with the rug in the entryway… and it looks as though there is a similar smaller one in the kitchen? Gorgeous. Also – such sweet boys! What a beautiful family and home. I think I am ready for a Spring trip to SF! I love their style and love seeing a two mom family on the blog! I love this! We’re about to bring baby number two (also known as the final baby) into our 900 sq ft home. The beauty and smallness of this home made me feel like we can do it (also feeling less guilt about getting rid of toys all the time). This home feels like the perfect mix of visually pleasing and comfortable. It’s clearly lived in but also so gorgeous! I love the artwork especially. I love that wedding portrait tradition!! How special! Beautiful home and beautiful family ! So glad to see some LGBT families featured here! Lovely space! Calm and serene! i love the quaint stain glass window. such a simple touch that adds such character to the home. Question though….how do you keep your house so freaking clean with two small boys????? Seriously. Kuddos to you. 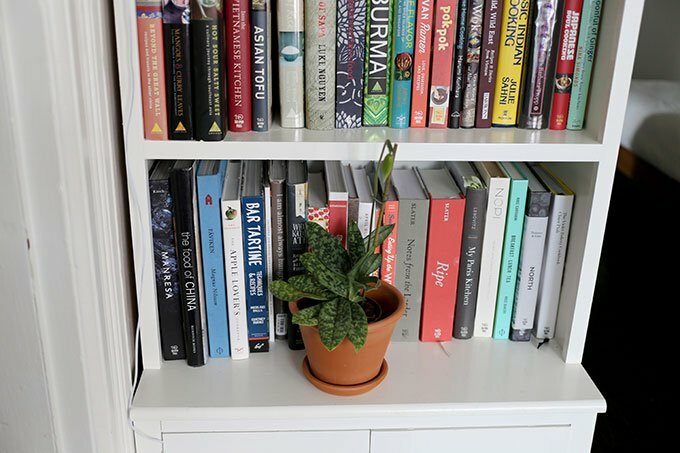 Alllll the heart eyes for the open shelving! And I love the family tradition of a painted wedding portrait. How lovely! I hope this isn’t too nitpicky, but Duboce Park is the actual park — the neighborhood is Duboce Triangle. The tip about buying a king bed right after a baby–could have saved us years of restless sleep. 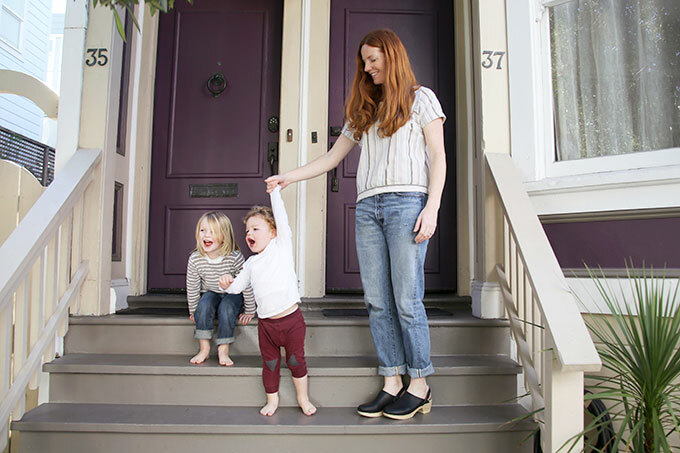 I know this post is about the home – and it’s beautiful – but I’d love to know where I can find the sandals Sarah is wearing! Me too!!! They’re stylin and look comfortable. Beautiful place. I love the artwork throughout the house. Wow, what a wonderful home and family! Everything looks beautiful, I love all the wood with white and plants. Thank you so much for sharing! Beautiful – one of my favorite tours so far. me too! i’m so glad you like it! 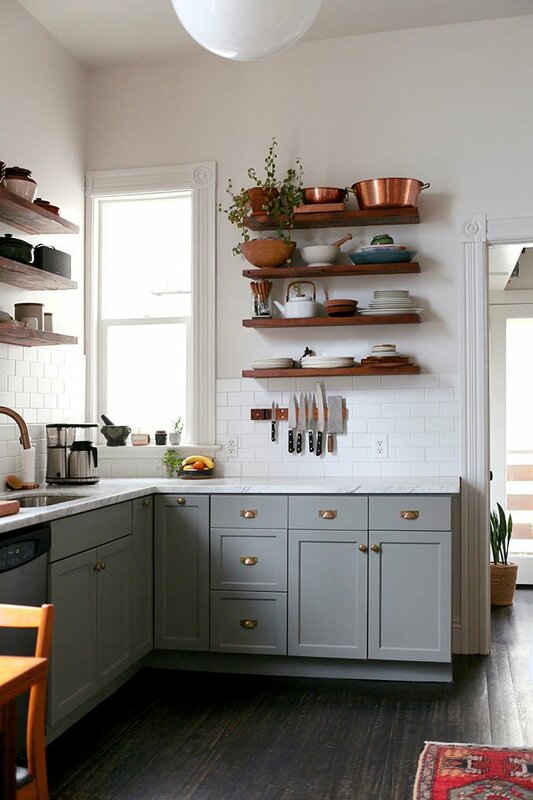 That kitchen is a dream and the cookware had me drooling! 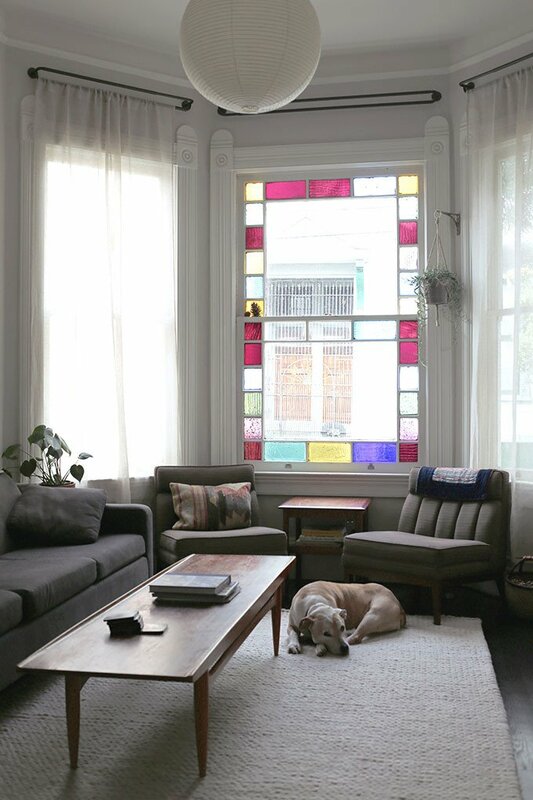 What a beautiful home… the ceramic collection is gorgeous, and I just want to curl up on the couch and stare out that stained glass window with a cup of tea for a while! What a lovely understated light filled home. I love the dark wooden pieces, gorgeous! The cot/baby crib is beautiful. I love how the little accents of colour are are used to add warmth too. What a lovely, calm space they created. 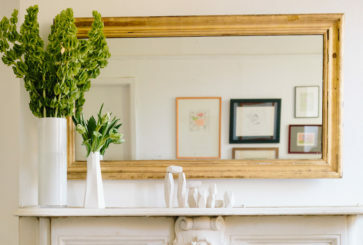 Love the candle sticks on the kitchen table!